As I’m sure you all know, February is American Heart Month. We’ve all been waiting with bated breath to celebrate it, with anatomically-correct jewelry and everything. MotoChic is a women’s lifestyle brand which I thought was aimed at motorcycle riders (but apparently isn’t, so much, anymore?) It’s doing good, at least, and planning to donate 20 percent of this month’s sales to the women’s heart health organization, WomenHeart. They’ve dubbed their campaign “What Makes Your Heart Race?” and are committed to supporting organizations that empower women. Which, you have to admit, is pretty fantastic. Cardiovascular disease continues to be one of the greatest threats to women’s health, according to the American Heart Association, and we celebrate both Valentine’s Day and American Heart Month in February. This has inspired MotoChic as a company to support a women’s organization dedicated to heart health this month: WomenHeart: The National Coalition for Women with Heart Disease, an organization dedicated to improving the health and quality of life of women living with and at risk of heart disease. “As a brand that empowers women, MotoChic is always looking to support organizations doing the same. In February, companies often focus on Valentine’s Day and while we love the romanticism of that, what really makes our heart race is helping women thrive and live what they love. We felt this would be a fun way to help women gear up and support a great cause,” said MotoChic Founder Debra Chin. Motochic describes the apparel and accessories it produces as made for “stylish women on the move,” combining leading-edge design with high-performance materials. Its current collection includes t-shirts, tank tops and sweatshirts all treated with an antimicrobial agent. This sounds like decent stuff to wear under your motorcycle gear, to be honest. Cute and not stinky, right? The white shirts, both long and short-sleeved, feature angel wings on the back that glow in the dark. Sadly, while the brand dabbled in producing actual riding gear a while back, the collection seems to have been whittled down to bags, a couple of base layers, a pair of socks and some tees. The market wants what the market wants, I suppose. When MotoChic came out with interesting (though not to my taste, to be blunt) riding gear aimed not just at women but at fashionable women, I had some hope! Alas. They are now marketing “high-quality design-conscious clothing and accessories” to “travelers, professionals, and life enthusiasts” and “women with fast-paced lifestyles.” Truly, what I want is a purse that doesn’t look like it’s been dragged through hell backward after a full commuting season knocking around in my topbox, but I do realize I am probably the tiniest market ever for that sort of thing. Right? Do I hear crickets? At any rate, if any of their merch floats your boat, now is the time to pull the trigger. 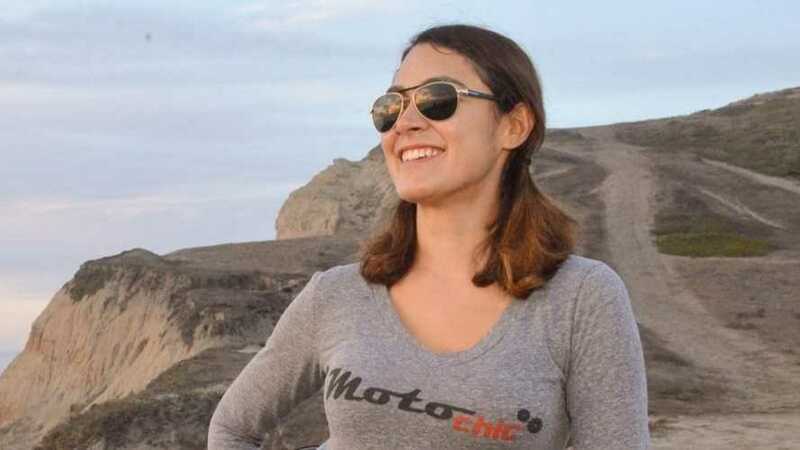 Twenty percent of all your purchases made on the MotoChic gear site will contribute to the “What Makes Your Heart Race?” campaign funds, and will be donated to WomenHeart. This includes the MotoAngels capsule collection as well as other clothing, bags, and socks for all of American Heart Month.